Pearl Harbor is more than a mere port or naval station. It is a workplace, a naval base, a home and a graveyard. To many Americans, Pearl Harbor is the ultimate symbol of treachery and our nation�s official entry into World War II. The harbor�s history is much longer and richer, however, stretching back several hundred years. Although recognized as a strategic port and surveyed by European explorers almost 200 years ago, it eventually took over a century to convert a native fishery on the island of Oahu into one of the most strategic naval ports in the world. The Naval Station, across Quarry Loch, was authorized in 1908. Dredging of the Pearl Harbor channel entrance began in 1910 and, on December 14, 1911, USS California (CA-6) became the first warship to pass through the new channel into Pearl Harbor. 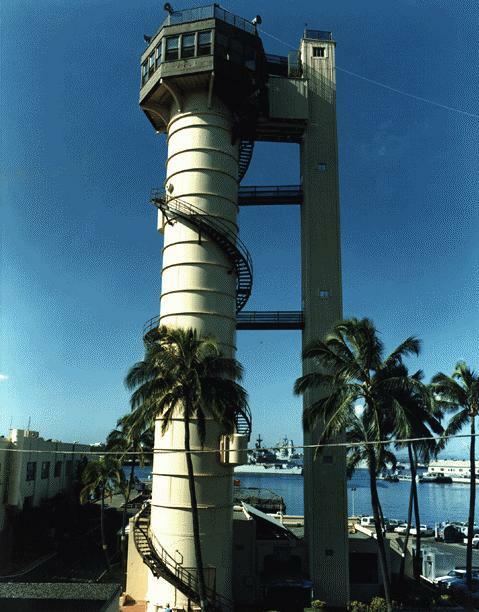 Today, the Naval complex at Pearl Harbor serves as a major homeport and "pit stop of the Pacific" for the submarines and surface ships of the U.S. and Allied Pacific fleets. 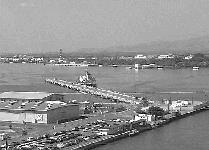 Naval Station Pearl Harbor had its beginning in 1912 as a receiving station located at Hospital Point. In 1940 the receiving station moved to the present Naval Station headquarters building. By 1954, ninety percent of the Navy�s enlisted personnel enroute to and from duty in the middle and western Pacific were processed through the receiving station. In 1955, Naval Station Pearl Harbor was established. The first submarines arrived in Honolulu in August of 1914. Four F-class submarines operated from the old Naval Station, at Pier 5 in Honolulu Harbor. During World War II, the Pearl Harbor Submarine Base serviced submarines which made 488 war patrols from Hawaii sinking a total of 2,009,744 tons of enemy shipping. The expansion of the Submarine Base reached its peak in 1944 when there were 6,633 enlisted personnel serving on the base. Since World War II, many facilities have seen change with permanent buildings replacing the old temporary ones and new facilities to service both the diesel and nuclear powered submarines of the fleet. A-3 Missiles were carried aboard the two-crew POLARIS Submarines that were homeported in Pearl Harbor from 1964 to 1981. The submarines actually operated out of FBM Refit Site III on Guam under the direction of COMSUBRON FIFTEEN. The submarine crews were stationed in Pearl Harbor for training when they were not "on-crew" for upkeeps alongside USS PROTEUS (AS-19) in Guam or on deterrent patrol. Today the Submarine Base consists of about 125 acres of land and 118 buildings. The Naval Submarine Training Center [the "Big Blue Building"] was built in 1962 to train submarine crews and SUBASE personnel who performed submarine repairs. It offers realistic diving and attack center simulators and has been extensively modernized to keep pace with the latest submarine technologies. Naval Station Pearl Harbor supports 50 homeported fleet units and 24 submarines, since merging with SUBASE. Naval Station�s fleet support mission is accomplished by a staff of nearly 2,000 military personnel and civilian employees. The station currently occupies and maintains 1,107 acres of land throughout the Pearl Harbor complex, ranging from Waipio Peninsula to Bishop Point and including Ford Island. The current plant value of the Naval Station is in excess of $1 billion. Naval Station Pearl Harbor provides service comparable to a large city. Operating the Navy's busiest harbor, Naval Station annually completes 65,000 boat runs and transports 2.4 million passengers and 200,000 vehicles to and from Ford Island and other harbor locations. Navy-manned USS Arizona tour boats transport nearly 2 million visitors to the memorial each year. The bachelor quarters house approximately 3,000 permanent party and transient personnel. Naval Station's Family Service Center provides essential training, counseling, spouse employment and family enhancement programs for over 55,000 people each year. Naval Station also owns and operates one of the Navy's largest recreation and special services programs, has its own police and security force and is responsible for DOD firefighters in 13 stations island-wide. The entire Navy is undergoing regionalization to determine better and more economical ways to deliver services at shore installations, by streamlining services and merging similar functions under one commander. Capt. George B. Covington, commanding officer of Submarine Base Pearl Harbor relieved Capt. Kraig M. Kennedy as commanding officer of Naval Station Pearl Harbor in a change of command ceremony on 25 July 1997. The ceremony marked the consolidation of Naval Station and Submarine Base, as part of regionalization efforts in Hawaii. Covington, SUBASE commanding officer since October, will lead the new merged command of approximately 2,100 military and civilian personnel. Instead of two separate organizations, each with departments performing similar tasks, there is now one streamlined organization, providing better services more efficiently. Pearl Harbor is modeling its regionalization plan on the successes of other naval bases, such as San Diego and Seattle, both of which have shown that regionalizing makes sense. Commander, Naval Base, Pearl Harbor Hawaii has first-line responsibility for implementing Regionalization and Claimant Consolidation for the Navy in Hawaii. Both initiatives are closely linked together and are necessary for the Navy to gain service improvements in Shore Installation Management, including food service, supply, building maintenance, firefighting, public affairs and data processing support. 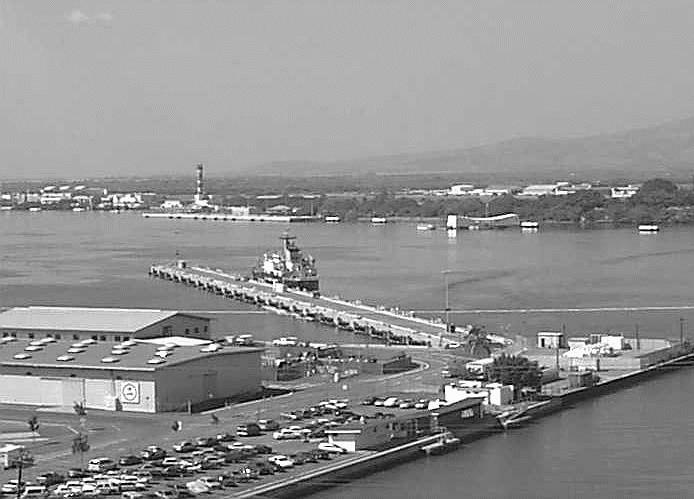 Individual supply departments from Pearl Harbor shore commands were consolidated into the Fleet Industrial Supply Center (FISC) Pearl Harbor in 1996. The result is local supply resources combined into one efficient and effective regional supply department.